The story opens with Raphael riding aboard a train on its way to Chicago. As Raph laments the length of the trip, he remembers the events that lead him along this path. A few days earlier, the Turtles had been watching the news and heard a report about a building collapsing in Chicago, apparently caused by the super villain Complete Carnage. Raph decides that he’s going to the Windy City to finish off CC for good. Leonardo doesn’t want Raph to go, and an ages old argument ensued. Raph is suddenly brought back to the present when the train he’s riding arrives in downtown Chicago, only to have the high rise tracks collapse beneath it. The ninja jumps clear of the falling train, but has a long fall ahead of him. Raph twists to ensure that his shell takes the brunt of the impact, and crashes through several floors of the building beneath him. Raphael is knocked senseless by the fall. His body rests in an apparent secret hideout for a group of costumed super beings named Beast Boy, Rock, Shrew and Widow. While unconscious, Raph dreams of recent events. The four Turtles had gone to visit Dr. Raven Shadow Heart – better known as the superhero called Radical. Radical transports the TMNT to the Dreamscape, where she tells them that the Council has suspended her powers for the time being. The Turtles are bewildered, as Complete Carnage has returned and it’s her duty to battle him. Radical explains that the creature in Chicago isn’t truly Complete Carnage, but a doppelganger created by some scientists that had found CC’s arm and regenerated a new body for it. Raphael wakes up to see the snarling face of the Shrew. The ninja lashes out and is promptly punched by the giant-sized Rock. A fight breaks out and as things get heated, the Savage Dragon arrives and tells everyone to knock it off. Dragon is investigating why the train bridge collapsed and looking for clues. Raph explains that it’s Complete Carnage, and the two green-skinned heroes head out to search for the villain. No sooner are they back on the streets than they’re attacked by Complete Carnage. A fight breaks out and it’s evident that this version of CC is more fierce than the original. Shortly the rest of the Turtles arrive to fight the monster. Savage Dragon punches CC and sends him flying through the wall of a nearby building… which begins to collapse onto our heroes. 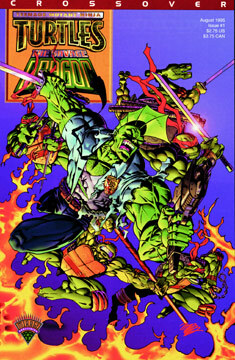 Concluded in The Savage Dragon #22 published by Image Comics.